International introduction and dating club. Love and family happiness in the real world. Russian Enigma provides professional services to bring single marriage-minded foreign men and Russian women together. Our Personal Tour to Rostov-on-Don, South of Russia is a secure, stress-free and effective way for singles to find each other in the real world. Russian Enigma works for busy professionals who have serious intentions to meet the future partner from Russia, who don't want waste time with online dating, who struggle to find their ideal partner, who are ready and flexible enough to travel and meet the ladies face to face. Russia Enigma is a real alternative to online dating. Discover the mystery of Russian woman's soul, find the way to win her heart and become the happiest man in the world! Read about Rostov women. Life is more bright and full when you can share it with someone special. Lets us help you! we will be a light to you, so that you may find your way through us. 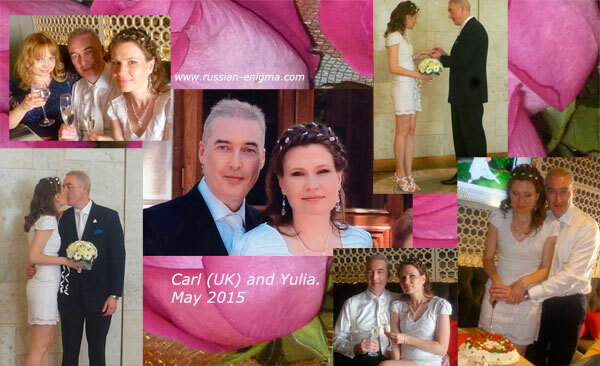 Congratulations to our new happy couple, Carl and Yulia. -take a tour to Rostov-on-Don to meet the ladies in real. Interested? Begin with our FREE TRIAL test! 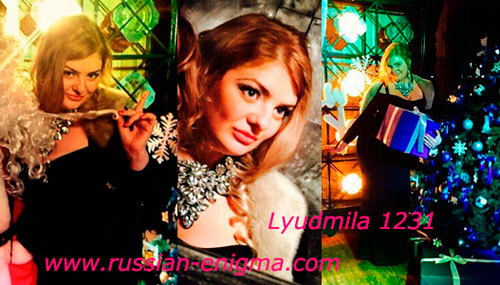 Send to russenigma@yahoo.co.uk your photos, description and the ladies' list chosen from Russian Enigma Gallery. Or go to Membership area to get more detailed information. Ready to travel? See how Russian Enigma tour works. Click Flowers and gifts delivery to make your order with Russian Enigma! When I remember Russian-Enigma , Elena and her friendly smile is the first image that comes to my mind. Our aim is to help men from different countries to meet marriage-minded Russian women and make a good family. We're working for everybody in the world who needs love, family and happiness. Life is too short and being unhappy and lonely is not the right way to live! Russian Enigma specializes in the individual holidays for Western single men searching for life partner from Russia. Individual (or small groups of 2-3 clients) can travel anytime. More info >> If you are interested, write to russenigma@yahoo.co.uk for more information. Meet a lady at your home country! Can't or don't want to travel? Invite a lady to your country! fast and easy correspondence via translator' s help. Russian Enigma is always willing to help you! We truly believe that a sense of optimism and humour are essential in meeting the demands of modern life. We hope that your time with us will be enjoyable and exciting. We will try to make you laugh sometimes and to be very optimistic, as we are, about finding you Your Special Lady. If you are genuine in your quest for love and happiness and the creation of a new family with your Russian woman, then we will do our utmost to help you and Your Special Lady from Russian Enigma to find each other. Please, e-mail us with all your concerns, questions, comments or suggestions! Age: 50 Height: 5 ft 8"